Do Miracles Really Happen? Sixteen-year-old Trisha is hugely embarrassed by her hip mom who rides around on a monster motorbike called Smelly Beast. But along with her exuberant little sister, Shivi, they make for a quirky three some, as Trisha adjusts to a new school, explores her talent for singing and falls head over heels for Akshay. Trisha's happy-go-lucky world suddenly comes crashing down when a fatal illness befalls her mother. She struggles to make the transition from a care free teenager to a responsible adult, hoping that some miracle will magically set things right. 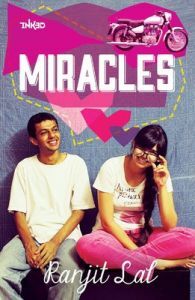 Poignant and deeply sensitive, Miracles is a heart-warming coming-of age story of a feisty young girl's struggle against her fate. Selling Points A coming-of-age YA novel by an award-winning author. A strong, like able set of characters. A touching story, high on emotion, but with generous doses of light-heartedness. Essentially a romance, but also a story about surviving against all odds. Ranjit Lal has written fiction and non-fiction for both adults and children. His books for Puffin include The Caterpillar Who went on a Diet and Other Stories, When Banshee Kissed Bimbo and Other Bird Stories, The Battle for No. 19 and Faces in the Water, which won the Crossword Best Children's Book Award in 2010 and the Laadli National Media Award.